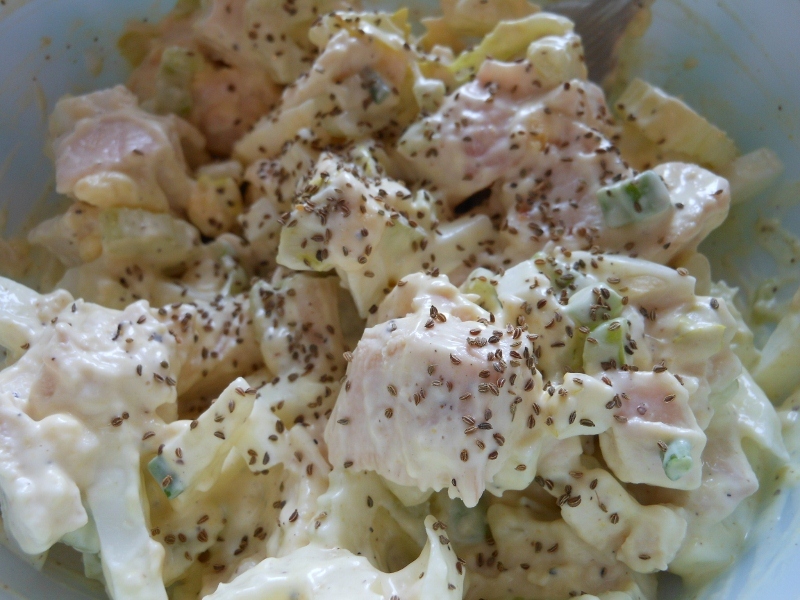 I’ve posted chicken salad before and I can’t say this time I really did much different this time except I forgot the onion and maybe used a little less mustard so I won’t bore you with a repeat recipe. Click here and I will link you to the original post! This time however I poached the chicken breast. I used boneless skinless chicken breast ~ in this instance I used two chicken breast so the recipe would need multiplied out to make as much as desired. To poach the chicken add chicken breast to hot skillet with about 1 cup of water. I went with rosemary for flavor; add 1 tsp rosemary and sprinkle with salt and pepper. Bring to simmer and reduce heat to medium; cook for 5 minutes, flip chicken over and cover with lid. Continue cooking 5 more minutes. 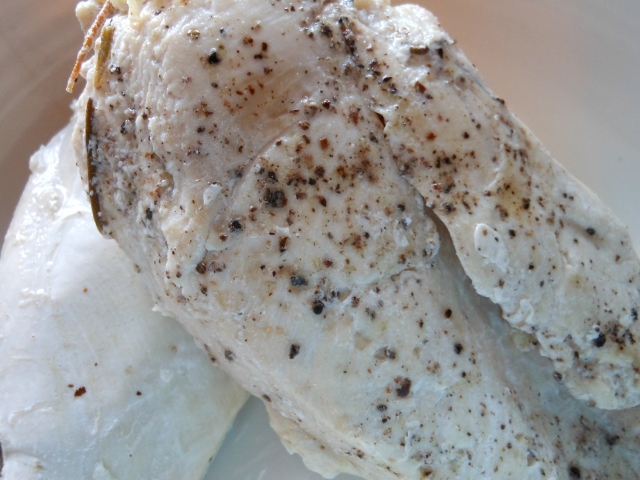 In 10 minutes you will have perfectly poached chicken. Remove from skillet and allow to rest for about 5 minutes. Cut and shred into desired pieces. I know I’ve been on a bit of a chicken run for a few days but I overstocked and needed to use it all up. I finished off the grilled whole chicken (a recipe I didn’t even post!) with this chicken salad. I had part of the breast leftover and knew Charles would enjoy some homemade chicken salad on his lunch break. I just went with a simple celery and egg version. I think it was quite tasty; if only he’d remembered the crusty bread I’d gotten for him he’d have enjoyed it even more! 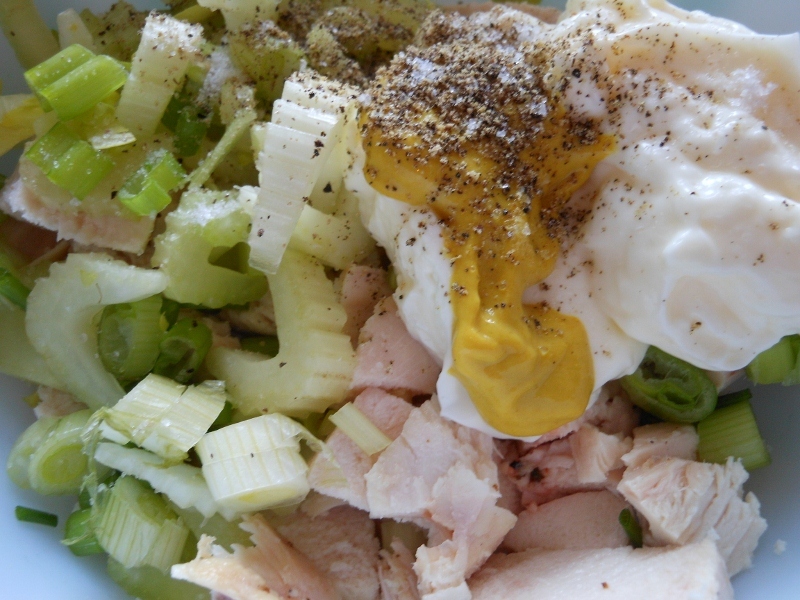 Combine chicken, mayo, mustard, celery, onion, salt and pepper. 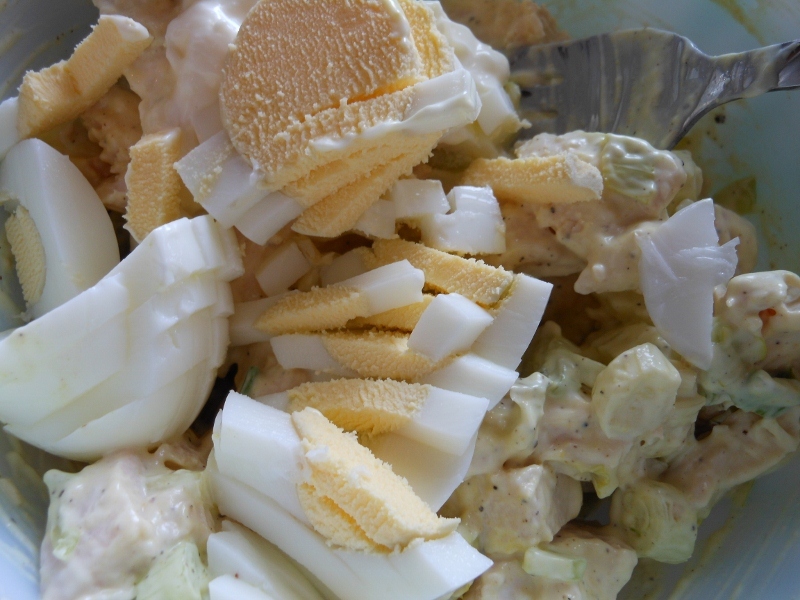 I like to add the egg near the end so as not to break it up too much; add additional mayonnaise if needed ~ I added about a teaspoon more. 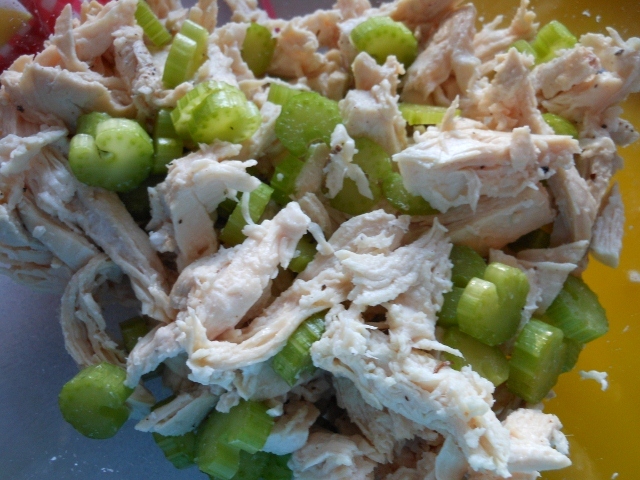 Sprinkle with a pinch of celery seed and stir; refrigerate until ready to serve.